Samsung Electronics Co plans to sell a variation of its flagship Galaxy S4 smartphone that will transmit data at nearly twice the normal speed, the head of its mobile business said on Monday. J.K. Shin, also co-chief executive of the world's biggest technology firm by revenue, said the phone would be sold in South Korea as early as this month. Samsung was in talks with several overseas carriers to take the phone, Shin told Reuters in an interview at Samsung's headquarters in Suwon, just south of Seoul. He declined to name the carriers. "We'll be the first with the commercial launch of the advanced 4G version of the smartphone," Shin said. A movie download that takes 3 minutes with conventional 4G would take slightly more than 1 minute, Samsung said. Samsung's shares have lost almost $20 billion since June 7 after analysts cut forecasts for Galaxy S4 sales by as much as 30 per cent on industry data that showed the high-end smartphone market was getting saturated. The same problem is hitting sales of the iPhone 5, made by Samsung rival Apple Inc.
Samsung's market capitalization is still a hefty $195 billion. Its shares closed down 0.2 per cent on Monday. 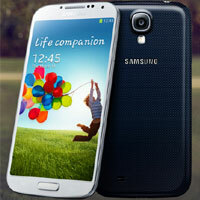 Shin showed little concern about sales prospects for the S4, which hit stores in late April. The mobile devices division is the company's biggest profit generator. "S4 sales remain strong. It's selling far stronger than the (Galaxy) S III ... and the new LTE-Advanced (4G) phone will be another addition to our high-end segment offerings that ensure healthy profit margins," Shin said. "As operators seek to provide more data-centric mobile services, I think this will become mainstream 4G technology globally in the coming years," Shin said. Shin also said sales of Samsung's tablet products in the US market jumped 3.3 times since it installed brand shops within Best Buy's stores in April, and is now considering expanding the format in Latin America and Britain. Samsung declined to name potential retailers. Having conquered the smartphone market that Apple virtually created with the iconic iPhone in 2007, Samsung is seeking to do the same in the network business with the booming 4G mobile equipment market, challenging bigger rivals such as Ericsson, China's Huawei and Nokia Siemens Networks. Shin said the network gear market was one of Samsung's fastest growing businesses, mainly thanks to 4G equipment sales which had been rising more than 30 per cent a year since 2010. The new phone would help this part of Samsung's business, he said. "Such technology leadership will set the pace for the competition and help us become a major player in the network gear market," Shin said. Samsung has won some 4G network deals from all major South Korean carriers, US Sprint Nextel Corp and Japan's KDDI Corp and Hutchison Whampoa's British unit, but it needs to crack China to close the gap with traditional vendors in the overall gear equipment market. Shin said there had not been much progress in Samsung's push to penetrate China's 4G equipment market yet, but it was increasing investment in the country. China's three mobile operators - China Mobile, China Unicom and China Telecom - plan to spend a combined 345 billion yuan ($56.3 billion) this year on network upgrades. That includes investment in 4G, which multiplies mobile broadband speeds by up to five times for users of iPhone and Galaxy phones compared with 3G. Many analysts believe Huawei and ZTE Corp - already big suppliers of China Mobile since only 10-15 per cent of 3G network contracts went to foreign vendors - will be winners, leaving others to fight for smaller bits of the pie.